In order to gain the experience necessary to secure a ringing permit, it is often advantageous for ringing trainees to seek opportunities to go out with other groups. 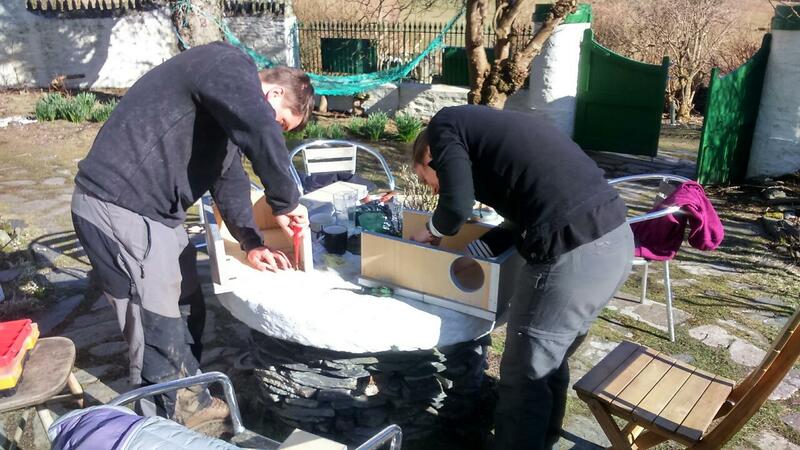 This article has been prepared by Stephen Vickers and Kirsty Franklin summarising two weeks of volunteering on the Calf of Man. 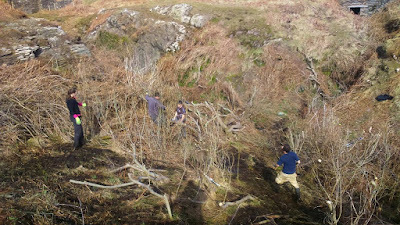 We arrived on the Isle of Man by plane in the early hours of March 26 and headed straight to the Calf of Man by boat. The entire journey was very easy; with shopping ordered in advance and delivered to the island on a weekly basis, we had no worries about bringing food. We left on April 9 after 14 days on the island, which was as much time as we could squeeze around work. 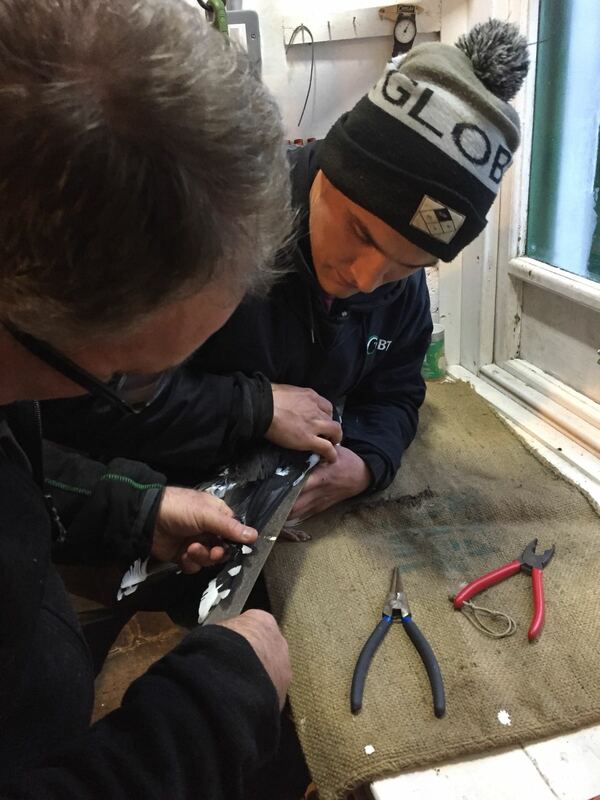 Ringing takes place on a daily basis on the Calf when weather permits. 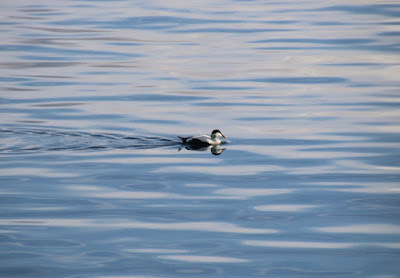 In fact, we both had a bird in our hands less than 10 minutes after stepping off the boat, so not a bad welcome! 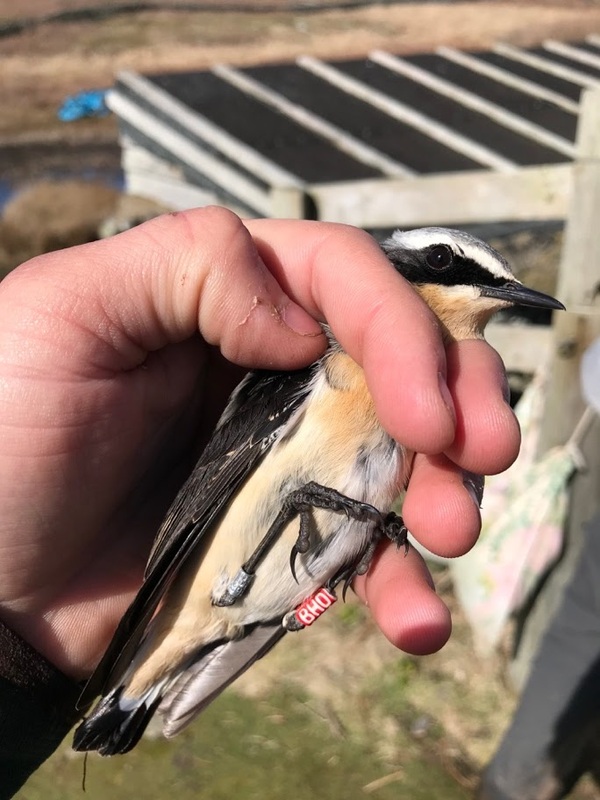 The ringing mostly consisted of mist netting and the use of two Heligoland traps, where we were treated to good numbers of goldcrests, goldfinches, robins, and more. This provided us with plenty of ringing and extraction experience, a great help on our way to our ‘C’ permits. The weather wasn’t always on our side, but we were still lucky enough to process 435 and extract 621 birds between us in that time. Unsurprisingly at a bird observatory, we were treated to some nice (uncommon) birds. 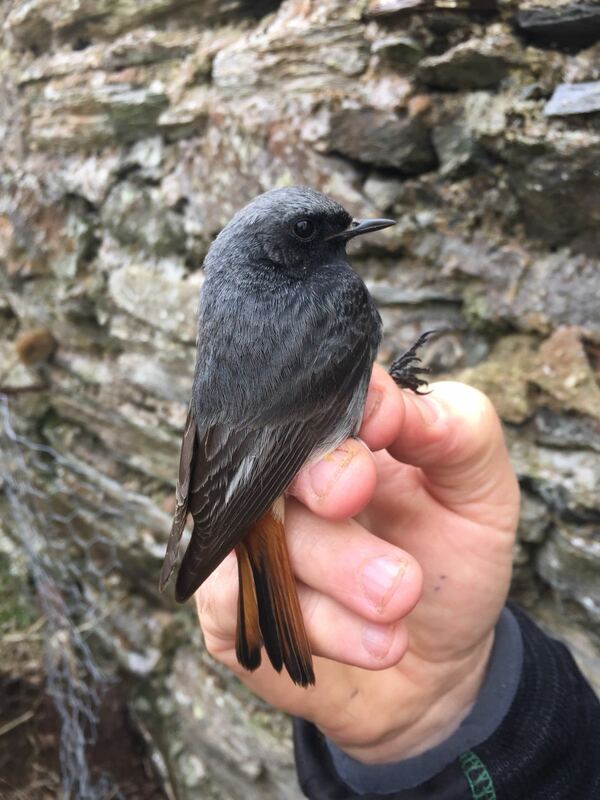 Kirsty was lucky enough to ring both a female ring ouzel, and a male black redstart. Whilst Stephen lost the coin toss on both uncommon birds, he got a chance to ring in his words “the best seabird in the world”. After finding a recently deceased rabbit, Stephen convinced the warden to let him use the large 1m2 spring trap with the rabbit as bait. Two days later, success struck in the shape of an adult great black-backed gull. As reward for the work he put towards catching it, Stephen was the lucky person to ring the bird. He hasn’t stopped speaking about it since! 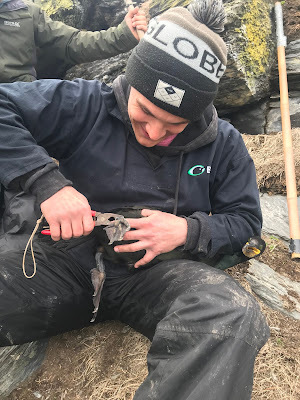 We also had a huge amount of fun visiting several breeding shag colonies, to make assessments towards measuring breeding productivity and attempt to catch some adults on the nest. With 27 nests found, some already at hatchling stage, it proved a big success. To top it off, we both got to ring two adult shags each. A great species to ring, that we wouldn’t get to do with Gower RG, and which also gave experience with a larger ring size (K ring). 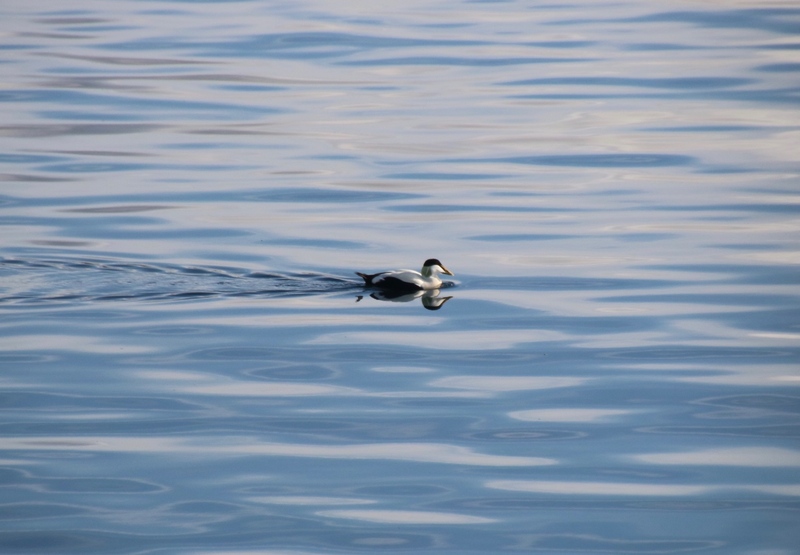 A couple of evenings were spent dazzling Manx shearwaters. Brown rats decimated Manxie population numbers on the island, and even now after many years of rat eradication and conservation efforts the population only stands at approximately 400 pairs. 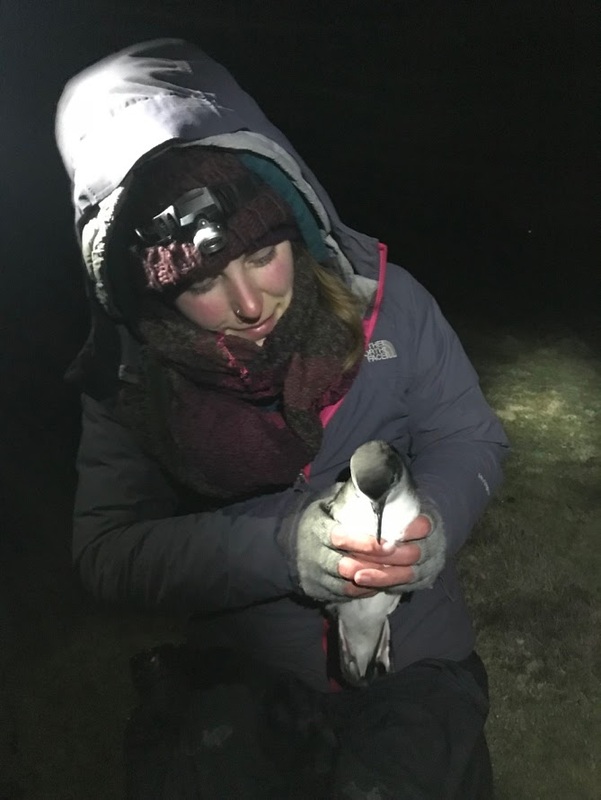 Whilst these numbers don’t quite match the populations on the Welsh Islands (360,000+ pairs), we had a very successful time processing 14 individuals between us and were able to get more practice of dazzling. It was also nice to ring a Manxie on the island where it got its name! Whilst ringing was a big part of why we went to the Calf, there was also plenty of other work to get stuck into to help with the running of the observatory. 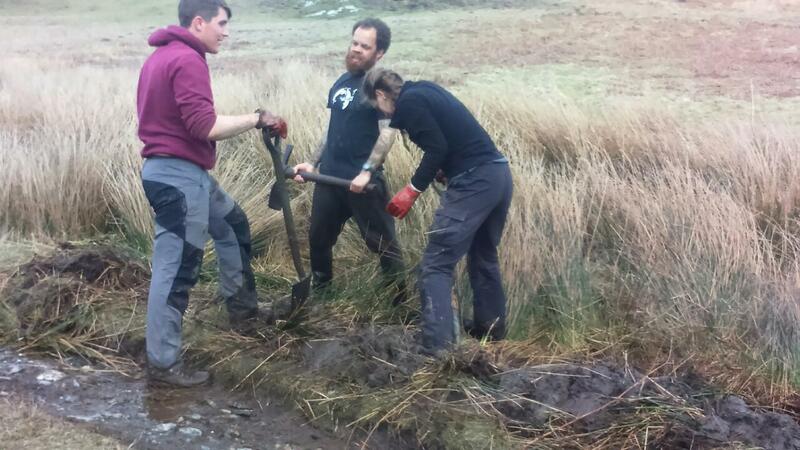 Jobs included drainage ditch digging to create new wetland scrapes, wildlife walks to contribute to the daily log of species recorded on the island, scrub clearing, and Manx shearwater nest box building. 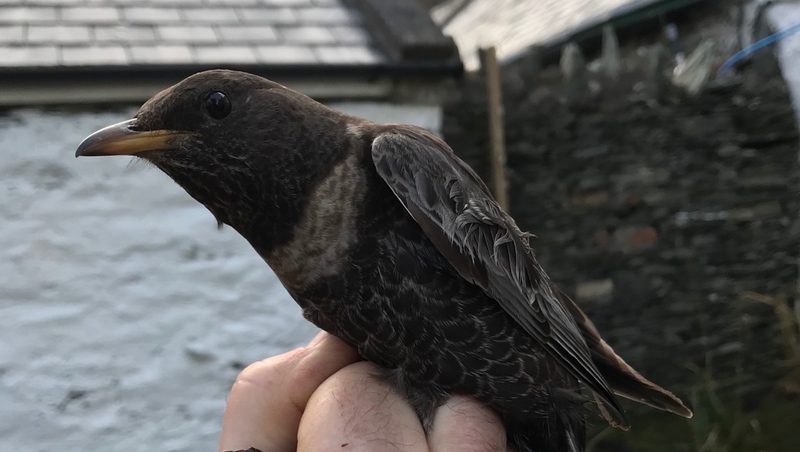 The Calf of Man was a great place to spend a few weeks ringing and volunteering, and whilst it was a cold delayed start to spring, we had great fun and saw some great species. Calf of Man Bird Observatory does not currently run a blog, but frequent updates on their ringing and other observatory activities can be found via Facebook and Twitter @CalfObs. Ornithological warden Aron Sapsford can also be contacted via email. Taking biometric data from the great black back.